Our third party conference ride gave us the opportunity to explore some of surprisingly attractive Dunfermline and discuss the importance of the right signage in the right place.. Helpful signage on the way to the conference venue! It was cold in Dunfermline on Saturday so I think someone at the Scottish Liberal Democrats took pity on me standing alone outside and triggered the fire alarm, causing all 400 or so delegates to join me in the Vine Centre car park for an impromptu discussion about the benefits of active travel and a quick distribution of our campaign postcards. In a more scheduled appearance, the leader of the Scottish Liberal Democrats, Willie Rennie, joined us later for a chat about the campaign and how well designed infrastructure can cater for both the sports cyclist and family on bikes. As a keen cyclist and runner, Willie is very supportive of measures to get more people in Scotland more active. Despite the cold and impending rain, a small band of resilient people on bikes launched off into the road as we were slightly confused as to where the shared use path started and stopped. Crossing a main road, it was good to be able to get straight across without being impeded by barriers. The shared use path on the other side of the crossing took us onto this, a popular path linking the Dunfermline Queen Margaret station to the town centre. It wouldn’t cater for mass cycling, but it worked well for our little group and kept us safely away from the main road. Unfortunately all good things come to an end and inevitably we were back onto the road, ‘sharing’ with the cars. We stopped several times to view the cycle user signage to discuss its effectiveness on helping us to locate an appropriate route through the town. Exhibit 1: Standing here at the end of the on road cycle markings, we could see a tantalizing path on the opposite side of the road. But with no drop curb or crossing you had to make a quick dash to get to it..
How did the cyclist cross the road? With difficulty..
Exhibit 2: This has two routes signed – one up a moss covered slope and the other into some bollards and a curb (or the pavement) – but no indication of where it might take you. Compared to the signage you find in the Netherlands, you might find yourself needing a map quite often to get around in Scotland’s towns. Exhibit 3: Most intriguingly we saw two segregated cycle path signs, but not a segregated path in sight. Nothing to see around here except the end of a pavement.. Thank you so much to our friends at Dunfermline Cycling Club for coming out and literally showing us the way around Dunfermline! It’s a lovely town with a superb Abbey in its historic centre and it could be a great place to cycle with the right investment in its infrastructure (and some better signs). The Women’s Cycle Forum has been attempting to break the mould of cycling conversations for the last two years, having seen one #AllMalePanel too many, and they will be bringing their informal round table discussion-led format into the political arena with a spot of ‘political speed dating’ – a chance to share your concerns and views with politicians from all parties. So far, confirmed participants include Green MSP and co-convenor of the All-Party Parliamentary Group on Cycling in Holyrood, Alison Johnstone, Conservative councillor Joanna Mowat and Lesley Hinds, Labour Councillor and Transport Convenor of the City of Edinburgh Council. The event will take place on Wednesday November 11th from 8pm at City Chambers in Edinburgh (after the reception for the Cycling Scotland Conference, for those attending, but you don’t need to be going to the conference to take part) and will be free, but places are limited so please book soon. As with all WCF events the evening will be women led but not women only – all are welcome to attend. – Tuesday 17th November (18:45-21:30) Spokes will be holding a public meeting in Edinburgh on Climate, Transport and Cycling (more details) with speakers Alison Johnstone, Dave Gorman and Tom Ballantine, followed by QA/discussion chaired by Kirsty Lewin..
– Wednesday 18th November (19:00) GoBike will be holding their AGM in Glasgow (more details) with speakers John Lauder of Sustrans and David Brennan (‘@magnatom’) of Pedal on Parliament. And finally, don’t forget Scotland’s Climate March in Edinburgh on Saturday November 28th – a chance to show your colours for Climate, Justice and Jobs, organised by the Stop Climate Chaos Coalition. After a great session chatting with delegates and politicians outside the AECC a small group of our more intrepid supporters (cycling in Aberdeen is really not for the faint hearted) set off on bikes to look at works on the third Don crossing and associated cycling infrastructure. With a child in tow (literally – Matt’s tagalong attracted a fair bit of attention before the ride) we opted for the shared-use path rather than the dual carriageway that runs alongside the conference centre. This got us off the road, which was a relief – but in places it was far too narrow for bikes to share with pedestrians, and ran in front of houses and shops, likely bringing people into conflict. There’s no point catering for bikes, if it ends up discouraging people from walking as a result. The new cycling infrastructure going in for the crossing is better – it looks like bikes and pedestrians each get their own space and by UK standards it was fairly generous. However, where the path met side roads it was the cars, rather than bikes and pedestrians which had priority (even when the ‘side road’ was a six-foot long dead end!). Sweeping corners meant that drivers wouldn’t need to slow down which can make paths like these very difficult to use safely as cyclists have to be aware of cars coming up behing them which might suddenly turn across their path. Approach to the new bridge over the Don – note that the ‘road’ on the left is just six feet long. Fortunately there is a better design – note this new Cycle Superhighway in London. Not only do cars have to give way to bikes, but pedestrians get a nice continuous pavement over the side road, making it crystal clear that active travel modes have priority. The corners are tight and square, so drivers are forced to slow down. It’s details like this that enable tracks to be used by everyone – fast commuting cyclists who don’t want to have to stop at every junction, as well as families accompanying small children or older riders who can’t easily turn their heads to check behind them. This is why we’re not just asking for investment – we want that investment to go on infrastructure that can be used by anybody, and that everybody will want to use. London’s new Cycle Superhighways show that it’s equally possible to design for such cycling in the UK – using existing rules and regulations but Scotland’s current design standards need to be updated and strengthened to make sure we get the same high quality infrastructure whether it’s in Aberdeen or Edinburgh or beyond. We know that the minister will be announcing details soon of an award for an exemplary piece of cycling infrastructure – let’s make sure that this is for something truly exemplary, from end to end, with no compromises where it gets a bit difficult at the junctions. 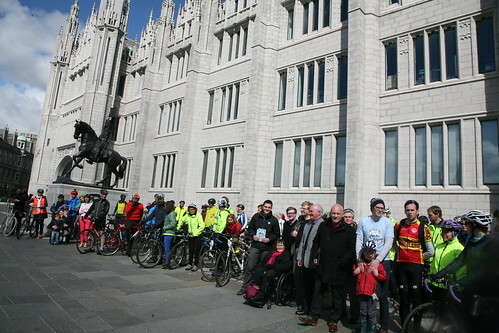 Thanks to everyone who came out on Saturday, including Minister Aileen McLeod and MSP Joan McAlpine, and the members of the Aberdeen Cycle Forum who led the ride (and guided us safely back to the train station). The next stop on our campaign bandwagon will be Dunfermline on the 24th for the Lib Dem conference – and Perth on the 31st for the Labour one. We hope to see you there! Saturday 31st October – 15:00 (note new time) outside the Perth Concert Hall – more details (Facebook event). The ride will be followed by a short photo opportunity and discussion with Sarah Boyack and Claudia Beamish at 5:15pm outside the conference venue. 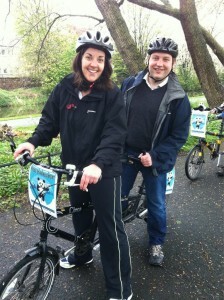 Will we get Kezia Dugdale to join us on a tandem as she did at Pedal on Parliament? Join us and delegates to the Labour Party conference on a short ride to explore the best and worst of Perth’s cycling infrastructure. This will be the fourth of our party conference rides when we’ll be inviting politicians and local campaigners to come together and see and discuss the problems and opportunities for active travel for themselves. After exploring the delights of Perth’s finest cycling infrastructure, we will return to the conference venue for the close of the programme to meet Sarah Boyack and Claudia Beamish MSPs for a short photo opportunity. The Perth Bike Station will be joining us and taking the opportunity to survey local cyclists on the day – come along before or after (from 2:30 pm) and get a free set of LED lights if you help them with their survey. If you can’t make it, please contact your local party and let them know you’d appreciate it if some of them attended. Join us and delegates to the Liberal Democrats conference for a photocall followed by a short ride to explore the best and worst of Dunfermline’s cycling infrastructure. This will be the third of our party conference rides when we’ll be inviting politicians and local campaigners to come together and see and discuss the problems and opportunities for active travel for themselves. Glasgow: Roads to Nowhere or Bridges to Everywhere? Glasgow was an excellent place to kick off our very first event – the Green Party Conference ride. Not only because we got a great turnout, and were ably led by folk from Go Bike/Space for Cycling Glasgow – but because the city as a whole illustrates so much about why our campaign is needed. Our ride took us over the recently opened ‘bridge to nowhere’ – a flagship project to reconnect two parts of the city long severed by the motorway. For over 40 years, the bridge stood as a half-built stub, a concrete reminder of Scotland’s priorities when it comes to transport. Now there is some recognition that a modern transport policy shouldn’t just be about motorised travel, and the money was found to turn the bridge to nowhere into a part of Glasgow’s nascent cycling network. Glasgow has the lowest levels of car ownership in Scotland – half of all households have no access to a car. It also has some of the worst health problems in the country, and, in Hope St, the second most polluted thoroughfare in Scotland (St. John’s Road in Edinburgh has the dubious honour of taking top slot this year). Investing in active travel has to be a priority: the Glasgow Centre for Population Health recently calculated that even with the modest network already in place, cycling saves the city £4 million a year in reduced mortality alone. Building a network that would encourage people to cycle – without seriously compromising the safety and convenience of those who already walk – would pay the city and the country back many times. Our ride explored the Clyde path, Glasgow Green, the segregated infrastructure on London and Waterloo Road and – of course – the Bridge to Nowhere. Although Glasgow has pioneered the use of kerbed tracks – and has shown itself willing to take some space away from roads – anyone on foot or on a bike still gets very little sense that active travel has priority over private cars, except in the shopping streets at the very heart of the city. Over an hour we experienced how bikes and pedestrians are brought into unnecessary conflict on narrow sections of the Clyde path, how roadworks around the Fastlink leave crossings (for bikes and people on foot) out of order, while the ones for cars are still in use, and how just 30 bikes simply couldn’t fit on narrow, penned-in, traffic islands, meaning it took us over 5 minutes to negotiate a single crossing. If Scotland ever does achieve its shared vision of 10% of journeys being by bike, then Glasgow’s cycle paths will be completely overwhelmed. Thanks to the delegates who came to join us on the ride or just briefly to say hello – we appreciate that conference is a busy time for politicians. We’re looking forward to our next event, the SNP conference in Aberdeen, on Saturday – where the conditions may be a bit more challenging. We hope we’ll see the same levels of support and interest as we got in Glasgow – and a recognition that we can’t wait another 40 years to start to build a brighter future. Saturday 17th October – 13:30 (note new time) outside the Aberdeen Exhibition and Conference Centre – more details (Facebook event). Join us and delegates to the SNP conference on a short lunchtime ride to explore the best and worst of Aberdeen’s cycling infrastructure. This will be the second of our party conference rides when we’ll be inviting politicians and local campaigners to come together and see and discuss the problems and opportunities for active travel for themselves. If you can’t make it, please contact your local party and let them know you’d appreciate it if some of them attended. You can find your nearest SNP representative here.